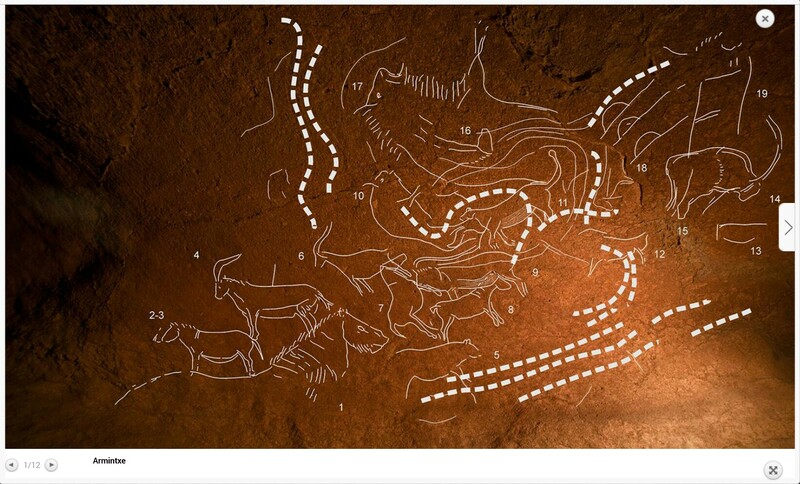 Yesterday the news about a recent discovery of a new Paleolithic rock-art site were disseminated in the media. The cave of Armintxe, with its beutifully and masterly carved panel full of animal figures, was presented to the public. The archaeologist and speleologist are still working on it, but the first results are quite relevant. I was told about this discovery the same day it happened. Two of the speleologist working, with Diego Garate and miself, on the archeological work at Atxurra, were involved in this finding. In fact, Iñaki Intxaurbe, who was the one who identified the first figures at Atxurra, saw the first engravings. More of them were quickly identified by the team formed by ADES speleologists and AGIRI archaeologists, and inmediatly the discovery was communicated to the local authorities and the cave was closed. During the last months some work has been done by the proffesor of Cantabrian University, Cesar Gonzalez, and Juan C. Lopez-Quintana from AGIRI, helped by ADES and supported by Bizkaia regional government. The first results have shown a big panel crowded with figures, displayed in a complex composition. Some of the figures are quit big, but many of them are relatively small, suggesting some sort of perspective. Some of the figures are represented in natural position, while others have been vertically designed. All of them have been engraved with the same technique, scratching the soft limestone with the fingers of with a dull point, resulting in very detailed and easy to see figures. The animals are represented with high detail, typical from Magdalenian art style, with hair, mouths, eyes, etc. carefully traced. Represented animals are horses, bisons, ibex and some carnivores. One of this carnivores has been undoubtly interpreted as a lion, which is an animal rarely present in Magdalenian art, albeit there are such representations in the Iberian Peninsula (Castillo and Casares for example) or in the Pyrenees (Istuitz, Erberua, Trois Freres, Tuc d´Audoubert and others). Besides, several sings, including clear claviforms, have been found there. The conventions used for representing animals and the presence of claviforms suggest that the figures could be related to the Late Magdalenian art. Armintxe has a close simmilarity with Tuc d´Audoubert french cave, having this one a bigger and more complex art repertory. The cave of Armintxe is situated in the coastal town of Lekeitio, in the Basque Country. In fact it is part of the same karstic complex then the cave of Lumentxa, where four years ago Diego Garate and myself found two bisons and a horse head painted in red, also of Magdalenian style. In Lumentxa it was an important Magdalenian site, excavated by J. M. Barandiaran, and very close the site of Santa Catalina, also with rich Magdalenian levels, was excavated by E. Berganza and J. L. Arribas. Close to Lekeitio it is situated the cave of Atxurra, wich has a rich Magdalenian sequence and the most important rock-art assemblage of the peninsular Basque Country. And above Atxurra, it is located the cave of Goikolau, with probable late paleolithic engravings. Considering this, in less than four years, a region with no (almost) evidence of Paleolithic rock-art, is now one of the most relevant places for the study of the Magdalenian complex in all the Cantabrian Region. The new findings of rock art sites in the Basque Country, that happened in the last decade, are the result of intense explorations made by archeologists and and speleologist, most of them initially done without any funding from public institutions. Grace to this work 6 new caves have been identified in Bizkaia, 6 in Gipuzkoa, and one in Navarre, ranging from Gravettian to Magdalenian. These new findings have substantially changed our views about Paleolithic occupations in the Basque region, and are opening new venues for research. El Neandertal toto ¡qué timo!